Originating in France, the Toy Poodle enjoyed popularity as a gun dog, retriever of waterfowl, and circus performer. They are believed to have descended from a nearly extinct water dog known as the Barbet and the Hungarian Water Hound. Today this breed is primarily utilized as a show dog and companion. The Toy Poodle displays a proud and dignified demeanor. They are sturdily built and have an elegant and lively gait. This breed is agile, athletic, and spirited. The Toy Poodle's most distinctive features are their natural drop ears and webbed paws. The Toy Poodle breed is affectionate, loyal, clever, and demanding. They do not do well if left alone for extended periods of time. If they become bored or lonely they will become destructive and bark incessantly. They are generally good with dogs and other household pets. The Toy Poodle does best with older considerate children. They are wary and suspicious of strangers, will alert their family to visitors or danger, and make good watchdogs. They are a happy and playful breed. The Toy Poodle must be bathed on a regular basis. The coat requires clipping every six weeks. There are four different clip styles: Show, Puppy, Continental, and English Saddle. It is important to regularly clean the ears and trim the nails. Proper dental hygiene is a must. Toy Poodle's are prone to ear infections, slipped stifle, eye problems, digestive and heart disorders, and skin conditions. The Toy Poodle has hair instead of fur. The texture ranges from wavy and soft to wooly and coarse. This breed is hypoallergenic and non-shedding. Early socialization and obedience are recommended. 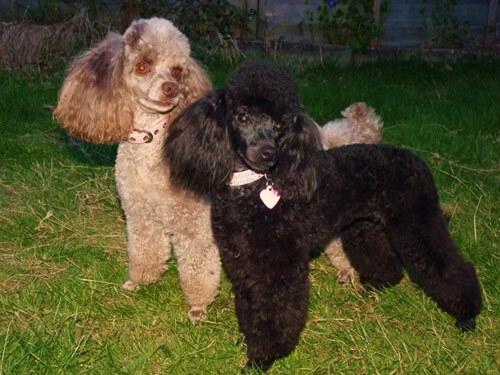 The Toy Poodle is highly intelligent and considered to be one of the most trainable breeds. They are sensitive and will not respond to harsh or heavy-handed methods. Toy Poodle's do best with fairness, patience, consistency, and reward. The Toy Poodle is suitable for city and rural living. This active breed requires daily walks and ample off lead playtime in a securely fenced yard.